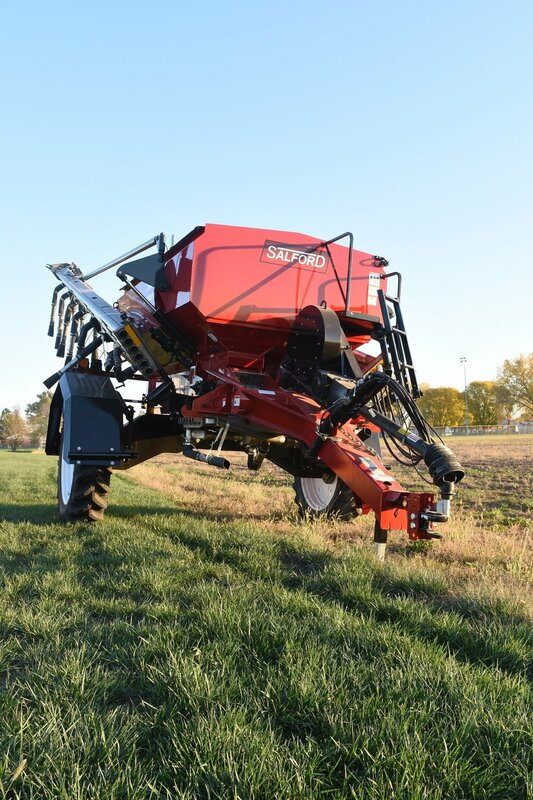 Designed to meet the needs of large-scale farm businesses, the Salford Valmar Airflo 8700 is a high-capacity, pull-type spreader that delivers the highest rates of application currently available in a commercial spreader. Are you interested in a quote or demonstration of the 8700? Please fill out the form below and one of our Territory Managers will be in touch shortly. Designed to meet the needs of large-scale farm businesses, the Salford Valmar Airflo 8700 is a high-capacity, pull-type spreader that delivers the highest rates of application currently available in a commercial spreader. Thanks to its advanced design, the Airflo 8700 delivers rates as high as 1,000 pounds per acre at 8 miles per hour, allowing you to finish large jobs faster than ever. The Airflo 8700 precise rate is a result of the single motor drive hydraulic metering kit that automatically adjusts on the go to ensure a uniform application rate regardless of speed. The hydraulically engaged metering system is based on a 30-setting, oil bath gearbox combined with a two-speed gear ratio to allow 60 settings that can be adjusted in increments of seven percent. This enables operators to select from more settings at closer increments, a feature that translates into more control over application rate for substantial savings in fertilizer costs. The 8700 is quipped with a hydraulic drive metering system for those using variable rate technology. The 8700’s extra-large, 230-cubic-foot hopper can carry up to seven tons of product (8708) or 357-cubic foot hopper carrying 11 tons of product (8711). The hopper itself is constructed of corrosion-resistant, painted 409 stainless steel and comes with a roll tarp installed. Originally designed to meet the needs of row crop farmers, the 8700 features axles which can be adjusted from 72 inches to 120 inches to accommodate most row spacings. In addition, the 8700 can be equipped with optional tire sizes to achieve greater flotation or narrower tracking, depending on the operation. The 8700 includes a number of important features that provide for increased durability and easier maintenance. For long life, the hopper and booms are manufactured from stainless steel. There is easy access to all mechanical parts including the manifold. Finally, calibration and emptying of the unit is easier, thanks to funnel trays that are inserted under the metering system for easy collection of material. The Valmar 8700 comes with a standard 60 foot row crop boom or 72 foot spread, allowing you to match boom width to your crop requirements. 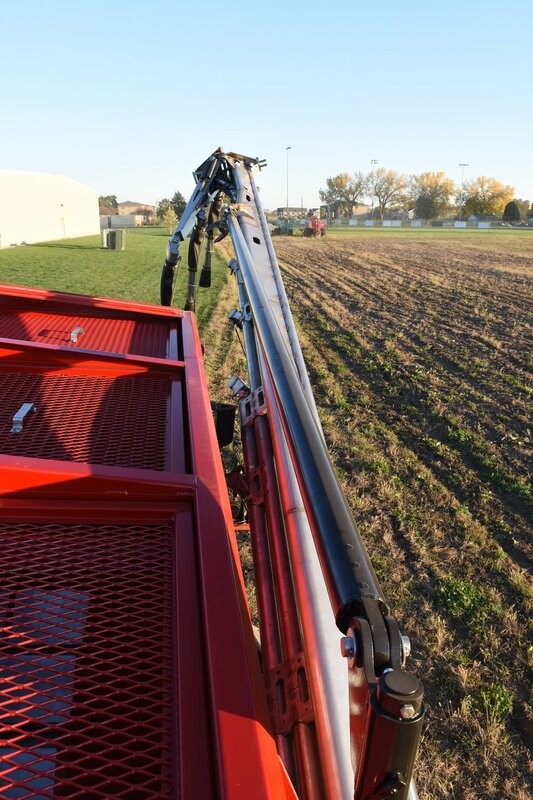 Booms are hydraulically folded and feature a hydraulic shut-off on the right boom to allow application on the left side only. All booms are equipped with rubber torsion boom suspension (which do not require any service and reduce friction, bouncing, and wear) and manual folding, break-away tips to minimize damage that may occur from striking obstacles in the field. Designed for easy use, all important field operations on the Valmar 8700 are hydraulically controlled from the cab through the use of three separate hydraulic lines (four lines with optional hydraulic fan drive). For example, the booms are folded, unfolded and locked hydraulically (through the use of a sequencer valve), allowing quick and easy transition to and from transport position. Also, the metering drive wheel is engaged or disengaged hydraulically and comes equipped with a lockout valve to ensure ongoing positive engagement. Finally, half width application is possible thanks to a hydraulically operated half shut-off clutch system that comes equipped with a pressure relief valve for trouble free operation. Salford's Valmar air boom applicators gently and accurately handle seed, fertilizer and other granular like herbicides. Equipped with 60 ft booms and drop tube kit, the 8700 delivers granular product on 30 inch centers. Combined with row crop tire options the 8700 has the clearance to direct cover crops between rows of established corn crops. Apply herbicide, seed, or micro-nutrients at the same time as you apply fertilizer with the addition of this second metering system. By adjusting the built-in hopper panel, you can create two separate hoppers. It comes with its own single drive hydraulic metering kit and electrically operated clutches which allow in-cab half shut-off of either boom. Its 30-cubic-foot hopper can hold up to 1,450 pounds of product at a density of 45 pounds per cubic foot and comes equipped with convenient hopper bottom slide gates to allow rollers to be easily removed for cleaning or inspection without draining product from hopper. Two motor independent drive left hand/right hand hydraulic main metering. Single motor drive hydraulic metering kit with electric clutches for left hand/right hand on/off. Total weight: Up to 10,500 lb. empty. Weight varies by model and options.